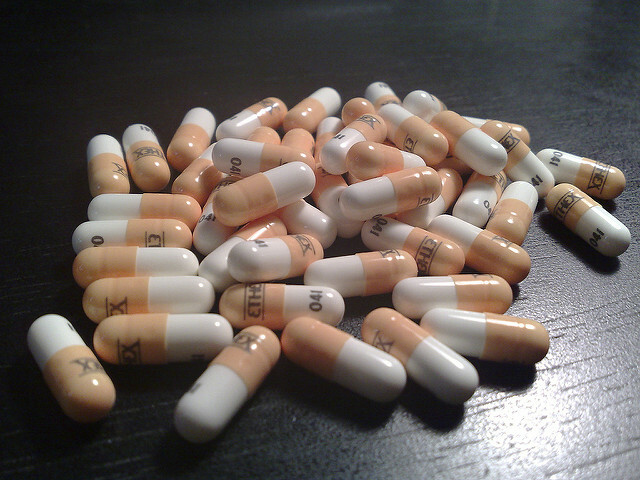 The federal government has grim news on overdose deaths in Pennsylvania. By the agency’s count, 3,383 Pennsylvanians died in drug-related overdoses in 2015. Heroin or opioid painkillers were found in 81 percent of cases, the report said. Heroin itself was found in more than half of all cases. 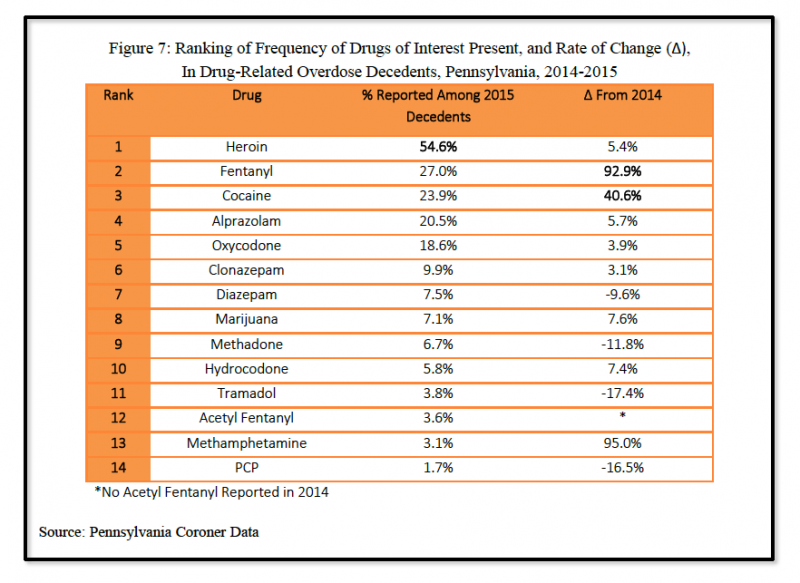 Fentanyl, a powerful painkiller, is the second most common drug detected. Its popularity has soared, and it was detected in more than a quarter of cases, up nearly 93 percent from 2014. By the agency’s count, 3,383 Pennsylvanians died in drug-related overdoses in 2015. Heroin or opioid painkillers were found in 81 percent of cases. Notably, the previous overdose total for 2014 of 2,497 deaths has been raised to 2,742 deaths for that same year, the report said. In other words, a year that already saw overdoses climbing to record levels was even deadlier than initially thought. Overdoses are notoriously difficult to count statewide and nationally. Standards vary between counties, and it’s up to local authorities to accurately track which drugs, if any, are considered responsible. If those results aren’t reported to the state or the feds, the overdose won’t appear in the official count, which is compiled from a variety of sources. The DEA said it received updated figures from several counties while gathering data for its new report. Previously, the Pennsylvania Coroners Association had asked coroners and medical examiners to voluntarily submit their overdose data so it could be compiled statewide. That number is close to the original federal number for the year, but is missing submissions from 13 counties. In the new DEA report, Philadelphia led overdoses with 720 deaths, followed by Allegheny County, which had 422 deaths. Victims in Allegheny County were overwhelmingly white men. They mostly used heroin, fentanyl and cocaine. 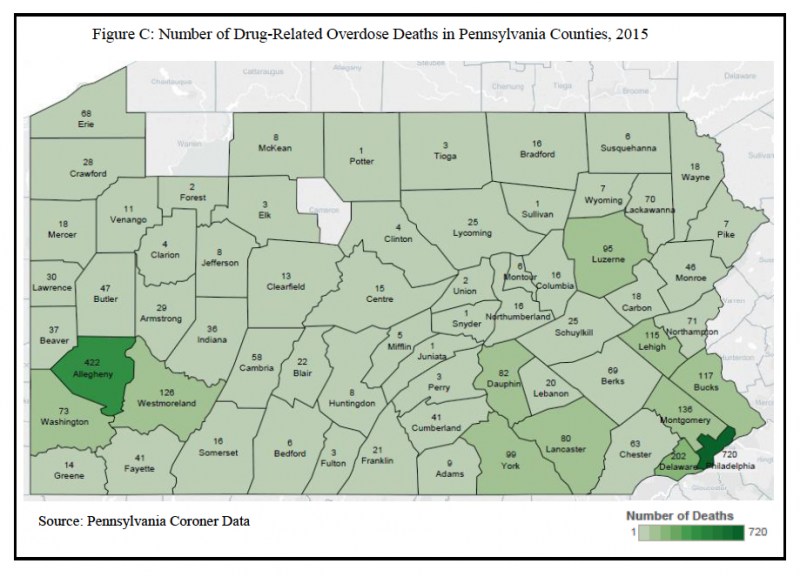 Other counties with a high volume of deaths were clustered around those two areas, as well as around Harrisburg. However, when deaths are ranked as a percentage per 100,000 people, the impact of the crisis on rural areas is stark. Philadelphia still leads, but it’s followed by rural areas such as Armstrong, Cambria and Indiana counties. Twelve rural counties ranked in the top 20. Allegheny County, which has a higher population and logically more overdoses by total, is ranked 12th when adjusted per 100,000 people. Statewide, overdose victims were 67 percent male, and 74 percent white. The median age was 40 years old, the report said. White males, ages 30 to 39 were the most common demographic group, accounting for 15 percent of deaths. They make up less than 5 percent of the state’s population. While heroin and opioids have been getting the most attention from officials and media, the report shows that cocaine appeared most frequently in overdose deaths of black victims. Overall, the presence of cocaine increased 41 percent from 2014. It is the third most common drug identified in state deaths. Pennsylvania’s overdose death rate is 26 per 100,000 people. Nationally, the rate was 14.7 per 100,000 people in 2014, the most recent available statistic. Explore the report for a county-by-county breakdown of victim demographics and the most common drugs detected. One of the agencies responsible for tackling the growing opioid crisis in Pennsylvania found stable footing in recent years, but that progress could be in jeopardy. Staggering overdose spikes in Ohio, West Virginia and elsewhere show how authorities remain daunted several years into an opioid crisis that kills thousands of drug users every year. Grants for life-saving services were awarded, and money was spent. Except the money was never really there.